The annual Christmas party must be the biggest event on the social calendar, so if you’re looking for a top evening of entertainment and fun this festive season, you’ve come to the right place! We offer a fantastic selection of shared and exclusive Christmas party nights, with something out there to cater for everyone. We know that each group, company and organisation are looking for something special, therefore one-party night does not fit all! We work with an incredibly diverse array of venues and suppliers – from stylish restaurants and vibrant bars, to sophisticated hotel suites and purpose-built venues, ready to play host to some unforgettable themed events this year. Why not take a browse of our amazing shared and exclusive Christmas parties and see for yourselves just how many brilliant choices we’ve got available? Whether you’re after an office Christmas party or just a get together with friends, there really is something here to suit everyone. To share or not to share – that is the question! 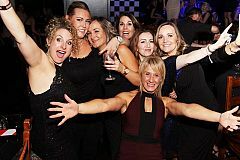 Our shared Christmas party nights (also known as joiner parties) are a great way for small to medium sized companies to let their hair down and enjoy the incredible production that a full-scale party night has to offer – just without the price tag. On the night of the event, you’ll join other groups, companies and organisations and come together to celebrate the best time of the year! Expect some indulgent food, delicious drinks and some breath-taking entertainment with the great Christmas party nights that we have on offer here! Get ready to throw on your best party clothes, because a festive event is the perfect opportunity to sparkle – make it one to remember this year and prepare to lose those inhibitions as you unwind away from the workplace and round off the end of the year in style! A shared party night isn’t for everybody. 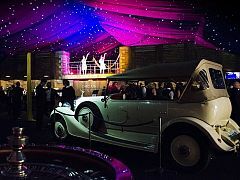 And for those teams that want a private event, then you’ll be able to pick an exclusive party from our excellent range. Ideal for those larger groups who’d like to enjoy a private night of celebration just with their team, then these fabulous Christmas events are for you! We’ve got a brilliant range of Christmas party nights in Milton Keynes with something that will appeal to every group out there – whether you’re after dazzling live entertainment, sumptuous meals and some of the best cocktails around, you can be sure that your group are sure to be amazed! Once you’ve found your perfect Christmas party in Milton Keynes, enquiring online through Eventa really couldn’t be easier! Simply fill out the enquiry form on the page of your chosen party package and hit send. That’s it. Your enquiry will then be sent straight to the venue, who will be in contact with you to discuss your festive requirements further. You’ll also receive an automated email from Eventa which will confirm receipt of your enquiry and will also provide you with a unique reference number for your records. It’s ALL UNDER ONE ROOF! No going from bar to bar, or losing member of the party. Plus you’ll be waited on hand and foot all night long!